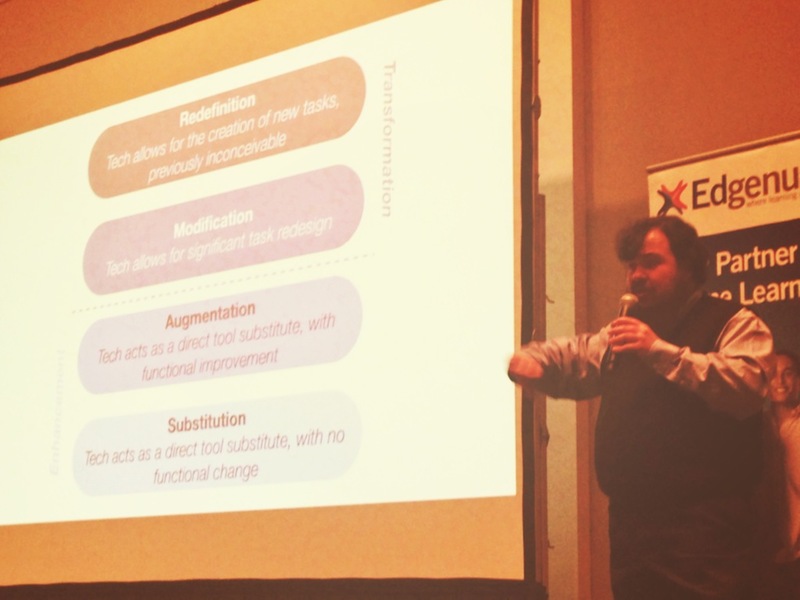 I recently got to watch the SAMR master himself, Dr. Ruben Puentedura take the stage at iPad Summit Boston. His SAMR model research is based on years of observing one-to-one technology integration in Maine’s Student Laptop initiative (now called MLTI as we love acronyms in education). At it’s simplest form, the SAMR model states that when you introduce technology to an environment, like a classroom, generally the first thing the user will do is figure out a way to use technology as a Substitute for an existing task. As you “climb up the SAMR ladder” you see a shift of pedagogical practice from teacher-centered to student-driven. This is exemplified by the “R” in SAMR which stands for Redefinition – or, simply put, when technology allows for a creation of new tasks, previously inconceivable. When researching our own 1:1, I kept running into this research and the more I delved into it, the more I understood and realized that in reality, it’s not a ladder at all that we are trying to climb, but something a little more nebulous and fluid. The problem with the “ladder” visual is teachers may think they have accomplished all they need to once they reach the “R” in SAMR and don’t know what to do next. This part of the visual really troubled me when talking with parents, teachers and administrators. Enter our middle school Ed Tech, Greg Garner (@classroom_tech). His approach to SAMR was simple: It isn’t a ladder that we should try to climb, but instead a pool that we need to be swimming in. I loved his analogy because I felt it provided a better reality of what happens with SAMR in a classroom on a day-to-day basis. It even inspired me to make this clever graphic (see below). Similarly, like when entering a pool that’s not at the ideal temperature, teachers sometimes need to walk in slowly, allowing their bodies to adjust to this shift. Some can just jump right in, knowing their bodies will eventually adjust, and at the same time knowing they can just stand up and jump out if they need to. Others need time, going in step by step slowly and at times gasping when their body enters the depths of new pedagogical practice. This idea of touching their toe in the water of technology integration is not new. A majority of our teachers want to test the water several times before fully submerging in it. If something should go wrong and they get water up their nose, it could be weeks before they are comfortable venturing back in. Eventually, they will get comfortable wading in the shallow end and want to venture out past the rope into the depths beyond basic technology integration. Once you cross the rope, you will not be able to stand up (except maybe hopping on your tiptoes for a little while). Someone venturing into this end of the pool, must have confidence in their teaching and know that they can tread water at times, but when things are going right and redefinition is happening, it’s almost like you can walk on water. This doesn’t happen everyday, but without the practice of stumbling around in the shallow end of the pool, teachers can drown by trying to go into the deep end too quickly. They need to think about the purpose of swimming there. Some may decide to jump off the diving board straight into the deep end and learn how to integrate from day one with a particular learning objective. Others, elect to take swimming lessons (Professional Development) and use the occasional swim noodle (instructional technology integrators) to help them stay afloat. In addition, they will want to make sure that a lifeguard (Principal) is on hand should they begin to really struggle and possibly blow the whistle when they need to take a break. The bottom line is without time, practice, support, and motivation, rarely would a teacher elect to venture into that deep end of SAMR. The amazing thing is, once a teacher does enter that realm, they may realize that they aren’t swimming alone. Swimming in the transformative deep end doesn’t mean the students are on the side of the pool cheering you on. It means they are in the pool with you – working, collaborating, problem-solving, and creating their future with you at their side. Posted on December 10, 2013, in Innovation, Leadership, Techy, Theory and tagged educational technology, instructional technology, pool, Ruben, Ruben Puentedura, SAMR, SAMR swimming pool, Swimming pool, technology, technology integration. Bookmark the permalink. 18 Comments. A great analogy for the SAMR model compares it to a swimming pool rather than a ladder. Fluid rather than linear. I also find it helpful to think in terms of tasks and specific usage of a tool being at a particular level of SAMR. In other words, an individual teacher is not “at” a particular level per se, but the way they or their students are using a tool at a given moment is what determines the level. Even a specific tool can be used at different levels, so, for example categorizing iPad apps by SAMR levels can give the wrong idea. Notability can be used to have kids fill out PDF worksheets, which I’d call substitution. Having them record audio of the teacher lecture while they take notes could be considered augmentation. Having students use it as a way to write up a science lab activity, including annotated photos, sketches, and audio that they then turn in pushes into M-R range. Connecting to your pool metaphor, an accomplished swimmer spends time at both ends of the pool, because some activities are perfectly appropriate for the shallow end, while other things (diving) can only be done in the deep end. I certainly agree with your views on both the app and the teacher/student. As you have correctly pointed out, an app can be used in wide array of ways, depending on the learning outcome/objective. As teachers become more confident and competent with planning for tech integration, they will begin to create more enhancement opportunities to extend the learners. Does this mean they will no longer visit the “shallow end?” Of course not, this will be dependent upon the LO. Thanks for your Notability example to help illustrate your point. I agree with you here. SAMR should not be based on the teacher, but based on how the teacher uses the technology in the classroom. I have seen many SAMR app wheels produced but I always caution my Masters students that it is how the tool is used that determines the level of SAMR. The goal should be that we try to use higher levels of SAMR when we teach to be able to push the higher level thinking. 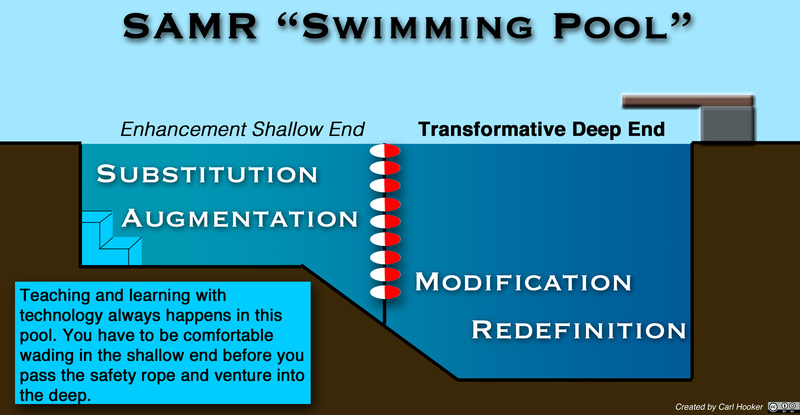 While I like this change to the SAMR model, I think it misses one key point… sometimes it is appropriate to swim in the shallow end even when you know how to use the deep end. We seem to forget that just because we can swim in deep water, we don’t always have to. There is a time and a place for both sides of the pool. Thank you for posting this. This post absolutely resonated with me as this was my first year flipping my foreign language class, especially that bit about sometimes feeling like I was walking on water. Truly a transformative experience. I think this swimming pool model/analogy is something that will be very helpful in encouraging “shallow-end” or “completely-dry” teachers to feel comfortable with integrating tech. Just popped by your blog to read this post again for inspiration for my own SAMR analogy I’ve been cooking up… I share this great comparison during my presentations when the topic of SAMR comes up. Thanks! I like the analogy of the swimming pool rather than a ladder when implementing SAMR. As a veteran teacher that after 13 years of teaching, was used to “jumping in” because there was a comfort level with the technology is now adjusting to a new school district that uses different technology than I’m used to. I feel like at times I am “jumping in” while other times I am easing in to “adjust to the temperature” by putting my toe in as I’m faced with something unfamiliar. I look forward to continuing through the SAMR process.